RiverWalk Resort at Loon Mountain owners receive special "perks" around the resort. The most obvious of these special amenities is located right in the middle of the lobby. The RiverWalk Owners' Club room is an exclusive gathering place, where friends and family create lasting memories of their extraordinary vacations. 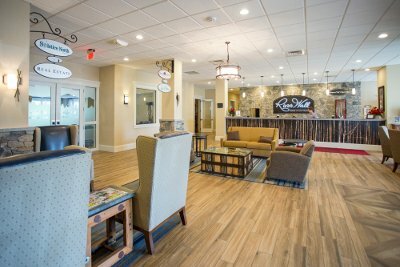 The RiverWalk Resort Owners' Club room is a fantastic space to gather with friends and family, to play games, to laugh out loud, to take in the beauty of the mountains, or to simply catch the game on the widescreen plasma TV. The room was imagined as a space where owners at the resort would retreat for a hot chocolate in front of the fireplace after a day on the slopes; a place to meet and 'chill' with other owners on a hot summer day; and a spot for owners to extend their own spacious suites when they've had more friends and family come for a visit. The room is equipped with a 70" curved plasma TV, which is outstanding for watching a thrilling movie, or watching the Red Sox win the World Series (yes, that will happen this year). Surrounding the TV are some of the most comfortable lounge chairs, each with their own drink rests and mini-tables. Opposite of the TV is the grand billiard table that is as new as the resort and ready for a challenge. Need a ringer, just stop into the sales office, there's a few OK players in there. Families love the idea that this is all included in their ownership packages. The room is laid out such that there are a few smaller gathering places within. Each little "nook" has comfy couches, coffee tables, and of course, room to relax. And, if you wanted to step outside onto the private owners' balcony and take in fresh air overlooking South Peak and the Pemigewasset River, simply walk out the door. Ahh, fresh air! Interested in reserving the room for an owner's function? Just let us know! We'll see you inside.